This UK publication is a visual treat with lovely patterns! 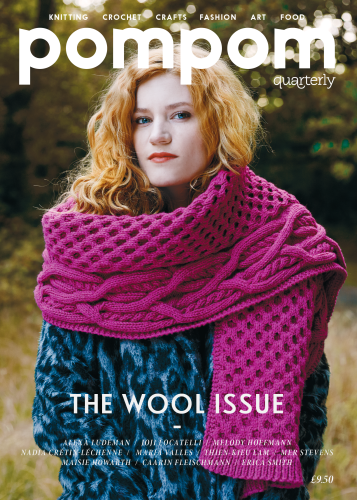 This issue celebrates the knitter s most treasured resource: wool. Articles include Anna Maltz writing thoughtfully as always on local yarns and fusion knitting, and the PPQ editors revisiting the John Arbon Textiles mill in Devon to learn more about the journey yarn takes before it reaches our hands. There are also a lovely comic from illustrator Katie Green, thoughts on going minimalist with your tools from Andi Satterlund, as well as a look at the ephemeral nature of film from Caitlin ffrench. Knit Bin has stocked only a limited quantity of this publication, but will restock and continue to acquire future issues if there is a demand.